For other uses, see Jon Foster (disambiguation). Jon Foster (born August 3, 1984) is an American actor and musician. His films include the drama The Door in the Floor (2004), the horror film Stay Alive (2006), the thriller Brotherhood (2010), and the drama Rampart (2011). Foster is co-founder of the electronic-soul duo Kaneholler, with his wife, Chelsea Tyler, the daughter of musician Steven Tyler. Foster was born in Boston, Massachusetts, the son of restaurant owners Gillian and Steven Foster. He has an older brother, Ben, who is also an actor, and who has described their parents as "free-spirited, Vietnam-protesting hippies". His paternal grandparents were Celia (Segal) and A. (Abraham) Frank Foster, a prominent judge and politician in Boston; their families were Jewish immigrants from Russia. His family relocated to Fairfield, Iowa after their Boston home was burgled while they were present. On June 20, 2015, Foster married Chelsea Tyler, daughter of musician Steven Tyler. 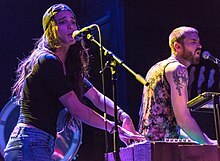 Together, they formed the electronic-soul band Kaneholler. 2000 Thirteen Days Kenny O'Donnell, Jr.
1999 Get Real Will Episode: "Pilot"
2000 Judging Amy Gregory Dox Episode: "Instincts"
2005 Law & Order: Special Victims Unit Justin Sharp Episode: "Intoxicated"
2012 Ben and Kate George Episode: "Pilot"
2013 Suits Trent Devon Episode: "Blood in the Water"
^ Bevan, Andrew (October 15, 2013). "Have You Heard of Chelsea Tyler's Band BadBad? Here's Why You Should Know the Aerosmith Offspring's Music". Teen Vogue. Condé Nast. Retrieved December 30, 2013. ^ Marr, Madeleine (December 6, 2013). "Rock royal Chelsea Tyler takes stage with badbad". The Miami Herald. The McClatchy Company. Retrieved December 30, 2013. ^ Cavagna, Carlo (July 2004). "Interviews: The Door in the Floor". AboutFilm.com. Retrieved November 3, 2009. ^ Fee, Gayle; Raposa, Laura (September 3, 1995). "INSIDE TRACK Pool barons foster son's fledgling career". Boston Herald. Retrieved November 15, 2010. ^ Sherman, Paul (December 9, 1999). "New 'Heights'; After landing the lead role in Barry Levinson's latest film, Boston native Ben Foster is flying". Boston Herald. Retrieved November 15, 2010. ^ a b Abel, Judy (November 15, 2009). "Exploring life's 'darker corners'". The Boston Globe. Retrieved November 15, 2010. ^ a b Miller, Gerri (1999). "Foster Reaches for the "Heights"". JVibe. Archived from the original on May 23, 2000. Retrieved November 12, 2006. ^ Breed, Allen G. (February 4, 1999). "Ben Foster reaches for new 'Heights'". Lawrence Journal-World. Retrieved December 10, 2007. ^ "Steven Tyler thrilled by daughter's engagement". The San Francisco Chronicle. ^ "Chelsea Tyler Claims Her Fame". OceanDrive. November 1, 2012. Retrieved October 12, 2013. ^ Yaeger, Jackie (January 7, 2015). "Chelsea Tyler Is In A Band With Her Beau". Nylon. Retrieved November 20, 2017. ^ Marx, Linda (June 21, 2015). "Chelsea Tyler and Jon Foster: The Cradle Also Rocks". New York Times. Retrieved November 20, 2017. Wikimedia Commons has media related to Jon Foster. This page was last edited on 4 February 2019, at 04:34 (UTC).